We offer a variety of devices that use mechanical or electronic means to accurately measure and display the water level in a rainwater tank. Other devices use this information to manually or automatically manage rainwater system functions such as backup integration, first-flush management, filter rinsing, and high-water transfer. MECHANICAL LEVEL INDICATOR: Our Mechanical Level Indicator mounts into a 1-1/2" threaded bulkhead fitting or a ring gasket installed in the top of surface storage tanks. The indicator housing sits on the surface of the tank A neutrally buoyant float hung from a nylon cord rises and falls with the water level, causing a pointer to spin and accurately display the water level from 0 to 100 inches. It's low cost makes it economical for the smallest tanks and even rainbarrels. However, since the indicator must be visible, it is not suitable for very tall surface tanks or for underground tanks. Calibration is quick and simple: the water level in the tank is measured with a stick and tape measure, the cover is pried open, the indicator ring is rotated so that the pointer indicates the measured water level, and the cover is snapped back in place. PNEUMATIC LEVEL INDICATOR: Our Pneumatic Level Indicator is our least expensive remote-reading system. It can be mounted up to 150 ft from the tank and will accurately display the water level from 0 to 100% by measuring water pressure. The dial gauge must be mounted in a dry location, calibrated to the tank depth (up to 8 feet of water), and zeroed. Pulling a knob at the bottom of the gauge operates an internal air pump that clears any water in the hose and the tank probe. The water in the tank then exerts pressure on the air within the hose and probe in proportion to the water depth, which is displayed on the gauge. This device is inexpensive enough to be affordable for any rainwater system and can measure in spaces with internal obstructions, including modular underground tanks where electronic devices require expensive pressure sensors to give accurate measurements. We supply a kit consisting of a dial gauge, a tank probe, a condensate trap, 100 feet of small-diameter hose, plus all of the fittings to connect everything together. WIRELESS ULTRASONIC LEVEL INDICATOR: Our Wireless Ultrasonic Level Indicator uses a directed ultrasonic beam to determine the water level in a rainwater tank and then transmits the data without wires to a display unit located in a building up to 1000 feet away. The water level is displayed as a series of eight lights, each representing approximately one-eighth of the tank height. Unlike more primitive ultrasonic devices, this unit features a high-power transmitter design that is unaffected by condensation, plus sophisticated electronic circuitry to eliminate stray signals, preserve battery life, and warn of problems such as rapid water loss possibly caused by a leaking tank. The direction of the ultrasonic signal can also be adjusted to provide accurate results with domed tanks. We supply a kit consisting of a tank unit, a display unit, two antennas, and batteries. An optional extension cable facilitates mounting the tank unit underground. Although ultrasonic units can be used in tanks made of any material, they should not be used in tanks with internal obstructions, such as modular underground tanks. WIRELESS ULTRASONIC CONTROL SYSTEM: Our Wireless Ultrasonic Control System uses a directed ultrasonic beam to determine the water level in a rainwater tank and then transmits the data without wires to a display unit located in a building up to 1000 feet away. Both the tank-mounted transmillter and and the interior display unit communicate wirelessly with a weatherproof control unit that can directly operate pumps or electric valves to provide backup, remote refill, or remote drain capability. Water level is displayed digitally in percent, along with the tank temperature and the signal strength. Control unit functions can be easily programmed and monitored with the diplay unit. Manual override capability permits direct valve or pump operation when desired. We supply a kit consisting of a tank unit, a display unit, a control unit, two antennas and batteries. Two versions are available based on the desired control unit: 24vac or 115vac. Note that power must be present at the site of the control unit to operate a valve or pump. DIGITAL LEVEL INDICATOR: Our Digital Level Indicator is an electronic device that accurately displays the water level in a rainwater tank from 0 to 100% using a radio frequency cable sensor that hangs in any open plastic or concrete tank. We supply a kit consisting of a digital display, a tank sensor, a sensor control box, and a power transformer. The display must be mounted in a dry location within 150 feet of the tank and wired to the control box mounted in the tank accessway. The standard sensor measures tanks with up to 9 feet of water; an optional longer sensor measures tanks with up to 19 feet of water. Since the system is powered by a plug-in 24 volt transformer, an electrician is not necessary for safe installation. Due to the possibility of radio-frequency interference, this device is not recommended for use in steel tanks or modularunderground tanks. RAINWATER SYSTEM CONTROLLER: Our Rainwater System Controller is a state-of-the-art digital electronic device with a sophisticated microprocessor that accurately displays the water level in a rainwater tank from 0 to 100% and manages rainwater system functions based on water level or elapsed time. All system functions are accessible through an intuitive programming interface that can display in English, Spanish, or French. Output relays provide 24 volt power to operate a low-water backup system, a high-water transfer pump, a first-flush device, a filter rinsing valve, a service reminder system, or a variety of other rainwater system functions. We supply kits consisting of a digital control panel, the appropriate tank sensor and sensor-control box, and a power transformer. The control panel must be mounted in a dry location within 150 feet of the tank and wired to the control box mounted in the tank accessway. 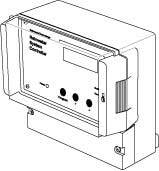 Since the system is powered by a plug-in 24 volt transformer, an elec	trician is not necessary for safe installation. FLOAT SWITCHES: When it’s not necessary to know how much water is in a rainwater tank, float switches can be used to operate a pump, valve, or other electrical device at a pre-set level. We stock mercury-free low-voltage (SPDT) and line-voltage float switches, as well as cable weights and transformers. Line-voltage float switches are provided with piggyback plugs for simple connection to 120v pumps. FLOAT VALVES: A float valve is a mechanical water valve operated by a float that moves up and down with the water level in a tank. Fill valves are used to keep tanks filled: for example, small "float tanks" used for backup systems, or larger "day tanks" used in commercial systems. Backup valves, also called part-fill valves, are used to maintain a minimal water at the bottom of a tank without filling the tank, assuring there will always be some water in the tank when there is no rain. We offer 1/2" low-flow fill valves and backup valves, as well as 1" high-flow fill valves and backup valves. More sophisticated cistern backup systems utilize a solenoid valve controlled by a low-voltage float switch or an electronic control device. Our commercial-grade solenoid valves offer the highest possible reliability for this type of backup. Unlike typical irrigation valves, they feature high-efficiency solenoids, stainless-steel actuators, and brass shock cones. If there is a power failure, they automatically shut off water flow. We stock 1” and 1.5” sizes. ELECTRIC VALVES: We offer a wide range of industrial-quality motorized ball valves, either two-port and three-port, in both brass and true-union-PVC configurations. All valves have PTFE seats for durability and full-port designs for minimal pressure drop. Stock sizes are 1”, 1-1/4”, 1-1/2”, and 2”. We also offer 4” and 6” butterfly valves with glass-filled polyproylene bodies and bolted PVC flanges. All motorized valves use state-of-the-art 24vac operators sealed for external use. Operators feature electronic torque limiters, LED status indicators, internal anti-condensation heaters, internal limit switches, and manual overrides. An optional power-failure return insert is available to assure continuous water supply for rainwater systems serving toilets or other critical water uses.